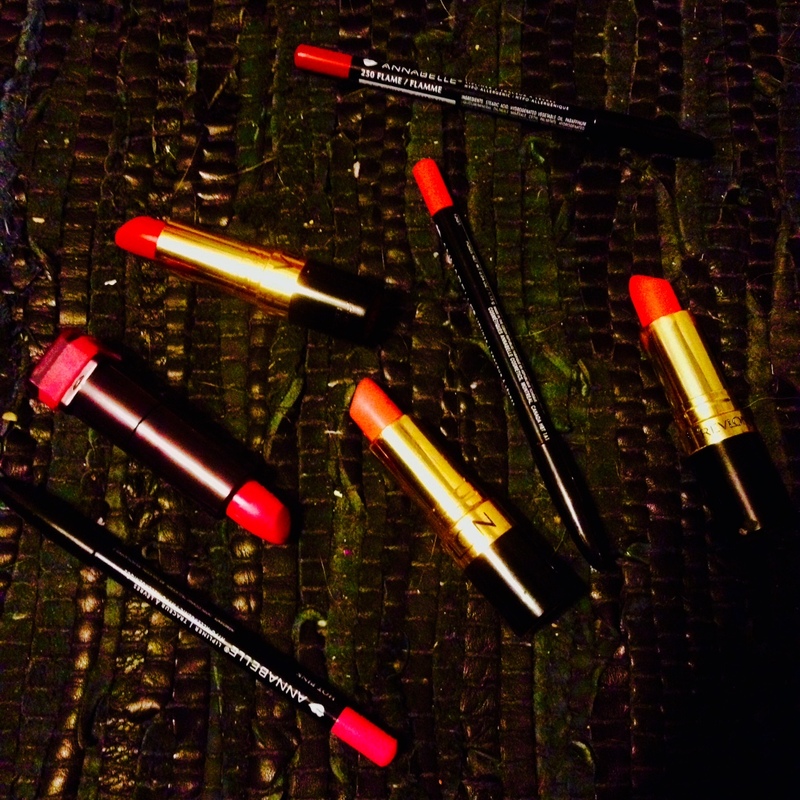 Let’s chat about lipstick today! Since vowing to get more brave in the makeup department, I thought I’d tell you how it’s been going so far and share the shades I’ve been wearing. Part of me really wanted to go all out and do a Sephora run but I knew that I’d be kicking myself if I spent $100 on three lipsticks and didn’t wear them. I decided I’d start out with drugstore shades and if I stick to it for more than three months and still like it, I’ll let myself choose a pricier one (oh, the things we talk ourselves into). I really, really, really want MAC’s Relentlessly Red and I imagine that will be my first splurge. I decided I wanted to try a hot pink, a bold coral and a true red and I also wanted to pick up a liner for each. I did a lot of playing around at Target with testers and assessing which colors looked best with my skin tone, keeping in mind that everything looked kind of crazy to me because I wasn’t used to it. I was able to decide on my chosen three fairly quickly with the help of my sisters, although I could have been there all day with how many choices there were. Annabelle had the most selection for lip liner colors by far and each liner came in at $3.69 a pop, which kept things budget-friendly. This bold fuchsia shade is a lot of fun and makes me feel very flirty and feminine. These lipsticks also smell like vanilla, which I love. The formula is super long lasting, although I do tend to add some moisture later in the day with a matte lip balm. I wear this color with Annabelle lip liner in Hot Pink. This one has been my favorite of the bunch and the one I’ve worn the most. It’s a vibrant coral that’s more red than orange and I wear it with Annabelle lip liner in Coral. I couldn’t find this shade on CoverGirl’s site anymore so I suspect it’s getting discontinued. Better grab this one in stores while you can find it just in case; I really like this one. It brightens up my face and is a great starter shade for transitioning to a true red. I really like Revlon lipsticks in general. I find the formula is moisturizing and long lasting. Revlon has a great selection of red shades and after debating between a few, I finally decided on Certainly Red. I found it was a little more neutral; red lipstick that is too blue or orange toned doesn’t seem to work on me. After some searching online for swatches, I also discovered that this one has been around since 1951! I figured with that kind of track record it had to be good. True red lips felt the scariest to me but are super fun to wear once I got over that. It’s amazing what a good red lip can do. I wear this shade with Annabelle lip liner in Flame. represented the colors and for that reason I decided you’d be better off checking them out in real life. Don’t forgo liner. One day I tried it without and things went South quickly. Blot after applying. It keeps things less messy. Add moisture. If things start to feel dry, add a matte lip balm, like classic Chapstick. Be prepared. Always carry your lipstick, liner and compact with you for touch ups. This is not a low maintenance look; bold lips are definitely a commitment. Be brave. Branching out felt a little weird at first, but I’ve been enjoying experimenting more. I definitely feel a little more fun and pulled together with bold lipstick. That’s it for now! If I have any new recommendations I’ll be sure to share them.